Even as a baby, mum Emma knew there was something different about Thomas. “Looking into his eyes I just didn’t get any feedback.” It became apparent that he was not simply a ‘late developer’ and autism was finally confirmed when Thomas was six. Thomas is also deeply affected by sensory overload: sudden noises, new or strange smells and sights can seriously affect him. “Thomas’ behaviour, actions and words are often repetitive, it’s a coping mechanism and shows he stressed and unhappy,” Emma explains. 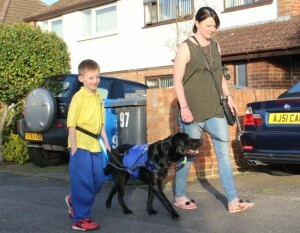 Briggs, a black Labrador has quite literally changed the whole family’s life. “I would not have believed the difference Briggs has made had I not seen it with my own eyes,” Emma says.